The number of bogus weddings has increased dramatically in recent years according to Home Office records. The scam exploits a legal loophole meaning that foreigners can stay in the UK if they marry an EU citizen working in the country. Under current legislation such couples are not required to show an intention to live together. The Home Office says it is already working alongside registrars across the UK to combat the problem, and has new measures in the pipeline. 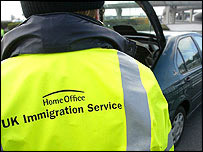 Under the Asylum and Immigration Act 1999, registrars are obliged to report suspected sham marriages to the Home Office. According to official statistics, the number of suspicious nuptials reported rose from 756 in 2001 to 2,700 in 2003. But a Home Office spokesman admitted: "We do not know the precise number of false marriages." Mark Rimmer, director of registrars in the north London borough of Brent, has said as many as 10,000 to 12,000 bogus marriages are thought to take place each year in the UK. Mr Rimmer, who works with the government to crack down on fake weddings, told BBC Radio 4's Today programme sometimes it is "absolutely obvious" that the would-be bride and groom scarcely know one another. Participants sometimes "can't communicate with each other, other than through an interpreter," he said. The Home Office already uses a number of tactics to combat fraudsters. Either the potential bride or groom must prove that that they have been living in the area for at least a week by supplying proof of address, such as a utility bill, and must provide a passport or ID card and proof of work. To add to these checks, the registrar must meet the couple and notify the Home Office if he or she has any suspicions about those planning to wed. But the current system is open to abuse. Both Mr Rimmer and the Home Office said the bogus bride and groom are often briefed on background details about one another, making the scams harder to detect. And couples often produce bogus documents such as bills and bank statements in a bid to prove their supposed residence in the UK. New legislation yet to be brought in will mean, from early 2005, anyone from outside the European Economic Area who wishes to marry in the UK will have to obtain a 'tourist certificate of approval' from the Home Office. The couple will then have to visit designated registrars who will check they have genuine intentions before they can marry. Andrew Green, chairman of immigration pressure group Migration Watch UK, said the current situation was a "measure of the chaos that the government has allowed to develop". Has the government lost control of immigration?